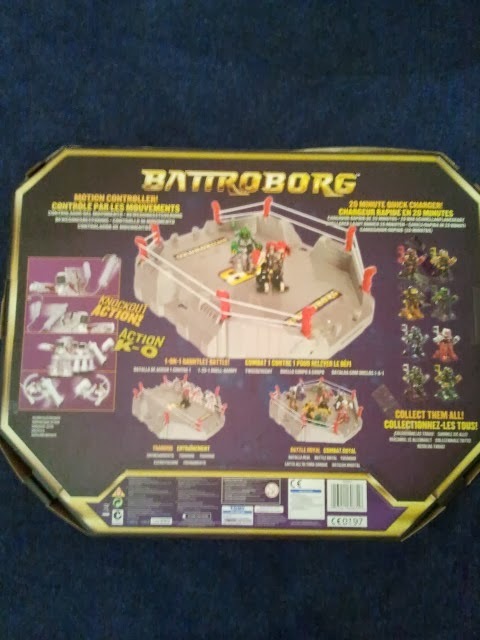 The boys were thrilled when we received Battroborg robots to review. If you haven't heard of Battroborg before they are the next innovation in robot gaming technology, Battroborgs are motion controlled battling robots built for combat and fuelled by your fists. You control the battle with a wireless controller that immediately transmits your quick jabs into your robot's swift hits. Battle one on one or against a drove of Borgs in three different competitive game modes. There are two robots included in the set along with 2 wireless controllers, 4 plastic drones (for practicing) and the arena. The arena was easy to assemble although you did need to push quite hard to get the posts in and my 12 year old son couldn't manage it but once we got them clicked in we were raring to go. The controllers need 4AA batteries each and these aren't included. Luckily we always have plenty of batteries in the house but it might be worth considering buying a pack if you are buying this as a present. There is nothing worse than getting a new toy and then discovering it needs batteries and you don't have any! The batteries do last a long time, we have had the toy for about a month now and we are still on the same set of batteries. To charge the robots you make sure the power switch on the robot and controller is off, you then insert the plug on the controller into the bottom of the backpack on the Battroborg. The controllers power switch is moved to charge and it takes about 20 minutes to charge and fully charged gives you about 20 minutes of playing time which is ample for plenty of fun. To play the game you place the robots at the edge of the arena and move your Battroborg into the centre of the arena. 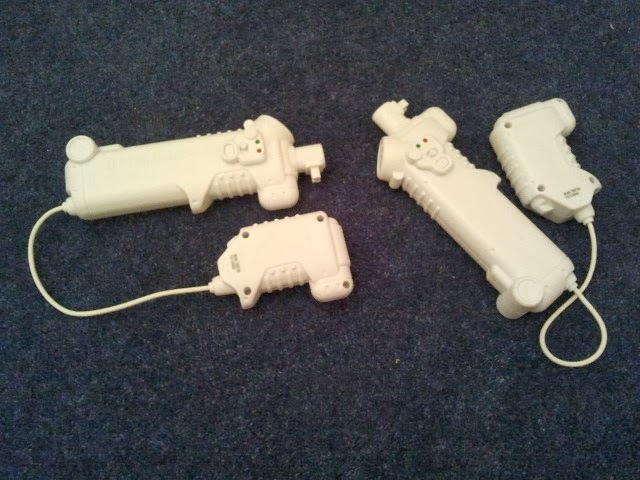 The large controller is held in your right hand and the smaller one in your left. The robots are surprising easy to move and all you need to do is punch with your left hand to make the Battroborg throw a left punch and move clockwise or punch with your right hand to make the Battroborg throw a right punch and move anti clockwise. We all quickly got the hang of it and started playing. There are three battle modes, Combat, Autodrone and Tag. Combat mode is the one we played the most and the objective is to gain five damage points on your opponent for a knock out. It is easy to tell when you have reached five as the light on the robot changes colour. The light starts out as green and then changes to blue, white, yellow, red and finally a flashing red light and a sound effect signifies that the Battroborg has been knocked out. The Battroborg also stops moving to be doubly sure that he has been knocked out. 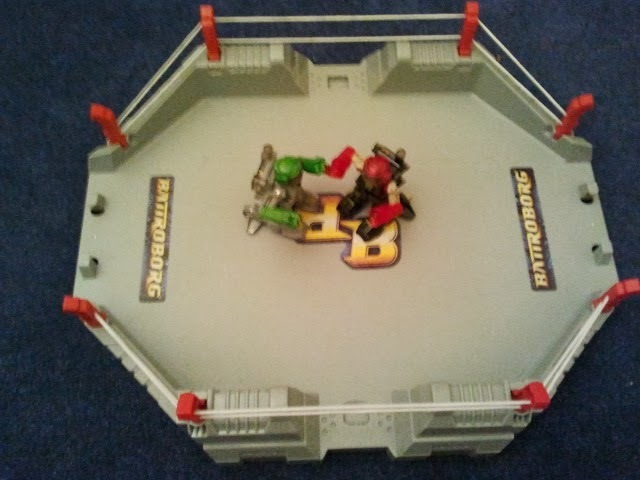 We have all really enjoyed playing with Battroborg, It really reminded me of Robot Wars, we used to watch it every week and having Battroborg was like having our own Robot Wars. Everyone has had a go and the boys haven't tired of it yet which shows it is a really good toy. Battroborg has it's own website which is well worth a visit. We received Battroborg for the purposes of this review, all words, images and opinions are our own.